Baljeet Singh hails from Khaper Kheri, India. He started his training in Indian classical music at a very early age from His Holiness Siri Satguru Jagjit Singh Ji. The spiritual teaching he received in Sri Bhaini Sahib gives his music a quality described as "the kind of music that opens our hearts". Later he received vocal tuitions from Sant Mohinder Singh of Amritsar. 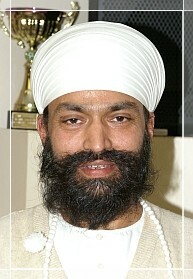 Baljeet Singh is one of the finest exponents of the tarshehnai in the world today. The tarshehnai is a string instrument with bow,4 main strings tune able with wooden metal knobs, 15 sympathetic strings tune able with metal knobs, 15 sympathetic strings tune able with ebony peg, fitted with metal horn, approximately 90 cms in length. He is a student of Tara Singh Of All India Radio. Baljeet Singh is a Grade 'A' artiste of All India Radio and has performed extensively in National Radio and Television, in addition to live concerts. To further his passion for Classical Music he was been blessed with the great (but rare) opportunity of learning from the legend maestros Ustad Vilat Khan and Ustad Bismillah Khan. Alongside his expertise in playing the tarshehnai, he is endowed with a captivating voice and a fine sense of rhythm and bhava, especially in rendering compositions of ragas from the Adi Granth Sahib.